Call owner Lena 515-975-7821. 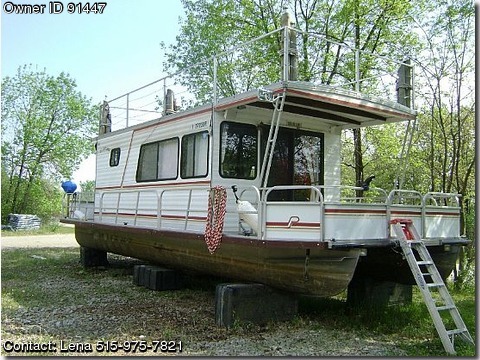 1986 Playcraft 35’ Houseboat Everything on this Boat Works Great !! THERE IS MOOD LIGHTING & WINE RACK ON LIVING ROOM SHELF FRIDGERATOR/FREEZER WORKS ON GAS, BATTERY & ELECTRIC QUEEN BED W/ SINGLE BUNK & THE COUCH FOLDS OUT INCLUDED IS A HONDA 3300S GENERATOR W/ ELECTRONIC IGNITION AC / HEAT UNIT OVERHEAD 80 GAL. FRESH WATER, 40 GAL HOLDING TANKS BATTERY INVERTER FAMILY SIZE MAGMA BBQ GRILL STEP IN SHOWER-SINK W/ SEPARATE TOILET UPPER DECK IS USABLE - GREAT FOR COMPANY OR SUNNING WHILE ON THE LAKE FULL CLOSET, ABOVE & UNDER BED STORAGE SWIM LADDER & LIFE JACKETS TOTAL REMODEL including: &#61558;	New this spring - “point of use” 2.5 g.